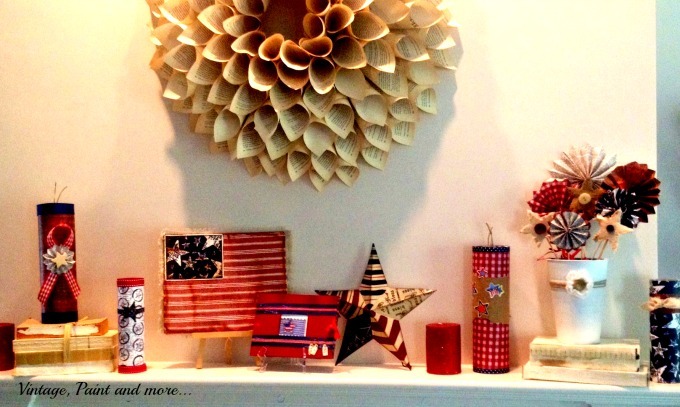 Since I decided to not to do a Patriotic vignette on my mantel this year and July 4th is just around the corner; I thought I would bring a couple of pictures from last year's mantel back to share with you. The pictures are dark because it had been raining for days and our living room is quite dark - almost like a cave, it seems. I totally recycled and crafted everything on this mantel. Nothing was purchased for it as I already had it on hand. 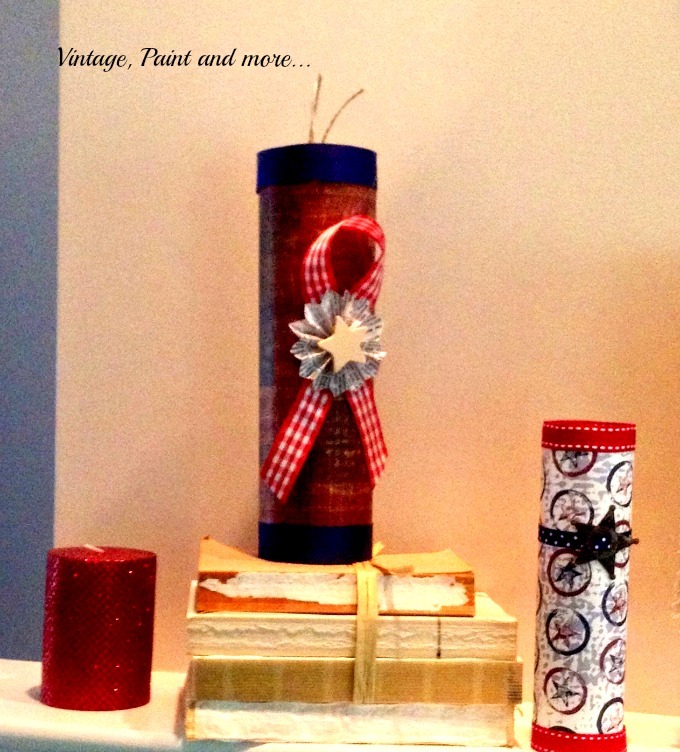 I used Pringle's cans to make faux firecrackers by wrapping them with Americana scrapbook papers and using scrapbook embellishments to decorate them. I also decorated prayer candles in the same way. I used old books without covers tied with raffia as lifts for some of the items and some glittery red candles left over from Christmas. The vintage looking flag was made with card stock and scrapbook papers then backed with a piece of frayed burlap. A small scrapbook I made a few years ago was displayed next to the flag and the star was a gift from my son. I painted a tin vase from Dollar Tree with DIY white chalk paint and then displayed a variety of pinwheels I made from scrapbook papers and book pages that were glued to kabob skewers. 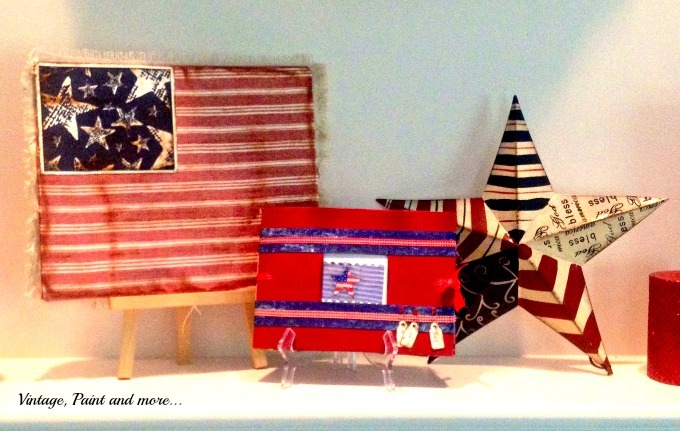 I was able to get a fun, patriotic mantel at no cost because I had all these items on hand. I love using scrapbook papers and seeing just what I can produce with them. They are so pretty and durable and really make a big statement in the home. 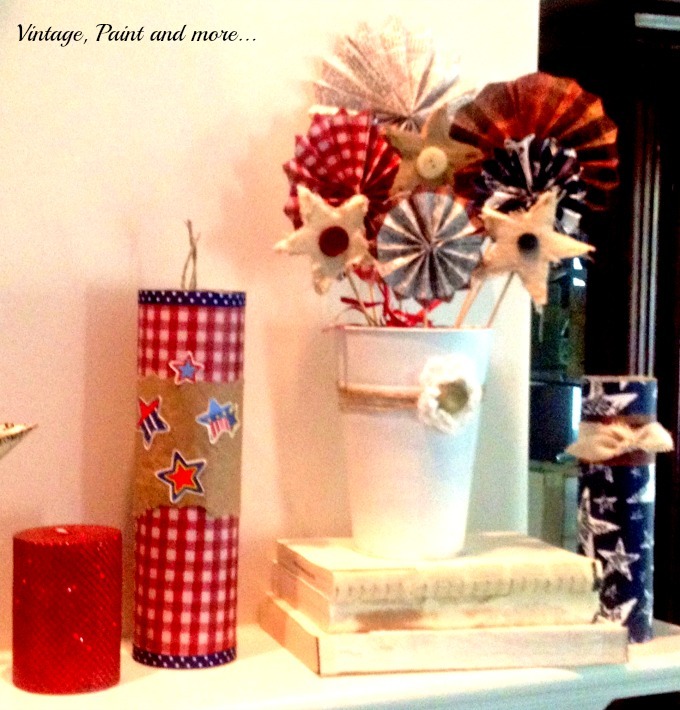 Have you decorated for July 4th or are you like me this year and skipping that part of the decor process? Tell me what you're doing in the comments below - I love to hear what you are up to. I answer all comments by email. I will be linking up to the parties listed on the " I Party At" page. Please go and visit some of them. Love your mantel and that you didn't go out and buy new stuff for it. I am working on my mantel, but I need the letter Y for J U L Y and I have to make it because like you I am using what I have. Love all your elements here and that flag is the best! How pretty, like you I'm skipping 4th of July decor... we're moving. I love these pictures from last year. I think it looks perfect for the 4th of July! Very lovely.